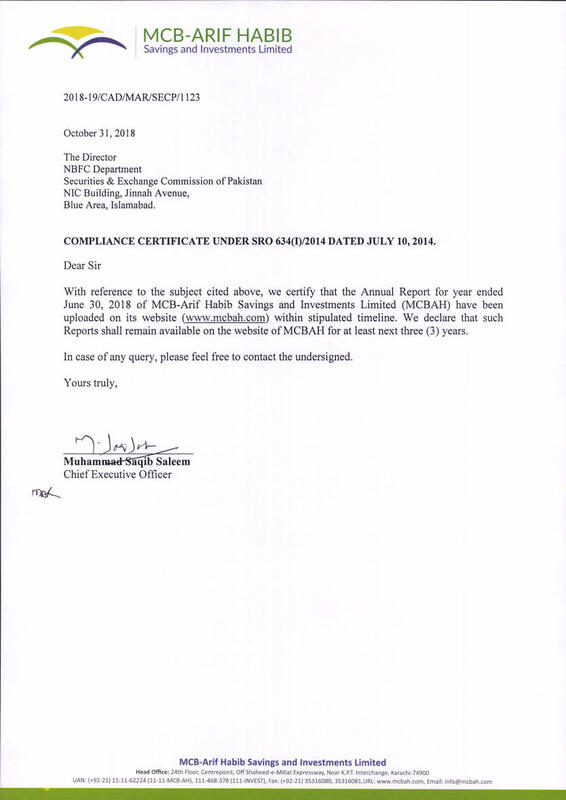 MCB-Arif Habib Savings and Investments Limited is a Listed Public Interest Company. D-21, Block 4, Scheme # 5, Clifton,Karachi. MCB is one of the oldest banks of Pakistan, incorporated in 1947. It was privatized in 1991. To accede to international capital markets, the Bank launched Global Depositary Receipts (GDRs) in 2006. It was the first Pakistani Bank that got its GDRs listed on the London Stock Exchange. In 2008, the Bank entered into a strategic partnership with Maybank, Malaysia, which owns 20% stake in it through Mayban International Trust (Labuan) Berhad. Profile: Float, administer and manage modaraba funds, modarabas and also acts as trustees of various mutual funds. Profile: One of the largest service providers for Electronic Transactions to various financial institutions / banks including related services in Information Technology, software and data processing. Profile: Asset management, investment advisory, portfolio management, equity research and underwriting. Profile: It leases various types of industrial equipment, public transports, real estate and retail auto leases. Arif Habib Corporation Limited (AHCL) is the holding company of one of the major business groups of Pakistan. The Company has a diversified portfolio across sectors including Chemical and Fertilizers, Financial Services, Construction Materials, Industrial Metals and others.AHCL aims to seek opportunities globally as well. The Company has begun to leverage its core competences and currently has invested in an equity brokerage house in Srilanka and has acquired membership of a multi commodity exchange in the UAE. AHCL has, over time, won several prestigious national and regional awards in recognition of its consistently strong financial performance, sound corporate governance practices and transparent comprehensive financial reporting through its reliable and experienced management team. AHCL’s brand name is built on years of commitment to the best interest of all stakeholders. The Company has a strong record of quality asset selection and decisive market timing but above all, adherence to high standards of best practices. Group companies own and manage assets of several hundred millions of US dollars. AHCL and its group companies are managed by its most important resource i.e. qualified and experienced professional employees. In order to further capitalise on this strength, the Company is constantly improving the work area environment and with emphasis on strong commitment to a dynamic and energetic culture that encourages innovation. The management team is responsible to protect the stakeholders’ interest in a manner that their interests are aligned with the Company’s objectives. AHCL is the flagship company of the Arif Habib Group. The company was incorporated on 14 November 1994 as a public limited company under the Companies Ordinance, 1984 with a paid up capital of Rs. 40 million. The Company was listed in 2001 on all three bourses of the Country by offering one million shares to the general public at a price of Rs. 80 per share (being the Book Value at that time) raising Rs. 80 million. The Company has had a distinction of being the winner of the prestigious “KSE Top 25 Companies Award” for many years since its listing. AHCL, over the years, has distinguished itself as a superior asset manager while keeping the risk at an acceptable level. Address: 24th Floor, Centrepoint, Off Shaheed-e-Millat Expressway, Near K.P.T. Interchange, Karachi-74900.